A while back, I posted about the role of ABR (Auditory Brainstem response) testing as part of a vestibular evaluation. The focus was primarily on the detection of acoustic neuroma or vestibular schwannoma, small tumors arising on the auditory/vestibular nerve. There is another consideration for the use of ABR testing in the vertiginous patient, in that it can provide information to help identify brainstem stroke that might be missed by CT scan. CT scans are fairly insensitive to emerging brainstem stroke, so we are always looking for cost effective alternatives. While a neurological examination, or a brief vestibular exam including the HINTS protocol are quite sensitive in detecting early brainstem stroke, the ABR test can play a role. The ABR test has lost its luster as a neurologic screening test over the years, and has largely (and in some people’s minds, completely) been replaced by more sensitive cranial MRI scanning. 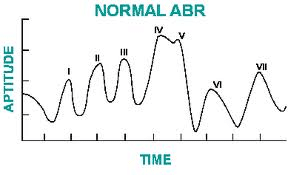 With the obvious financial pressures health care providers are feeling, maybe we ought to consider our old friend, the ABR test. In order to do that, we have to look at an old, but good study. Back in 1985, before MRI scanners were ubiquitous, a study out of the University of Alabama School of Medicine compared the relative contributions of CT scans and ABR tests in identifying patients with known brainstem infarctions. The infarctions were detected primarily by clinical presentation.